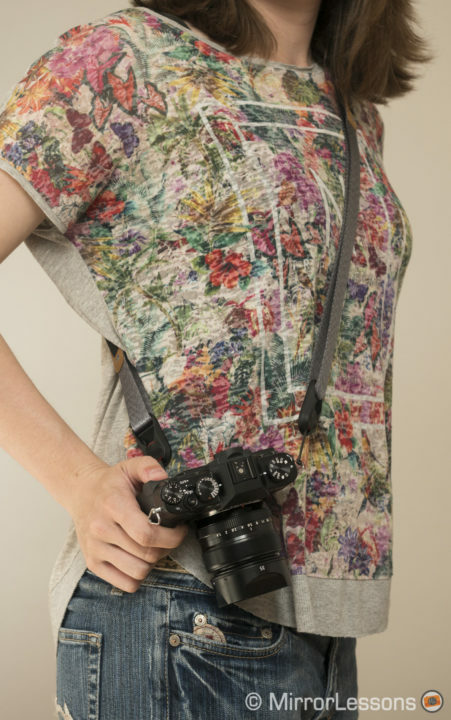 Since starting MirrorLessons, we’ve had the good fortune of being able to test not only many cameras over the years, but a lot of camera straps too. 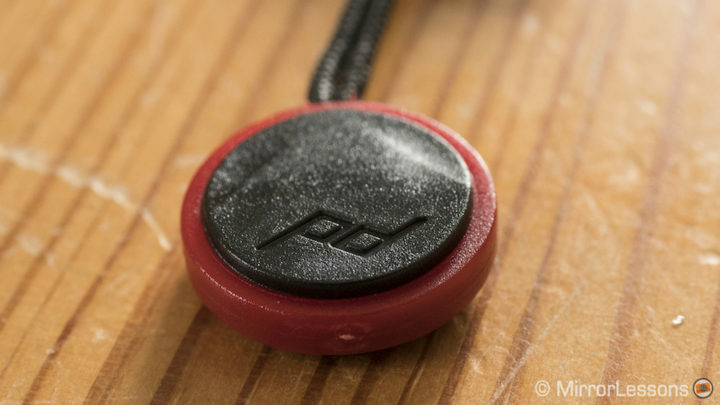 Of all the brands we’ve used so far, one in particular blew us away from day one with their innovative approach to designing accessories for cameras, and that’s Peak Design. The straps I’m reviewing today are the updated versions of their popular Leash and Cuff which we received to test a month before the official launch date. We’re pretty excited about these new products and if you’re a Peak Design fan, we’re sure you will be too! 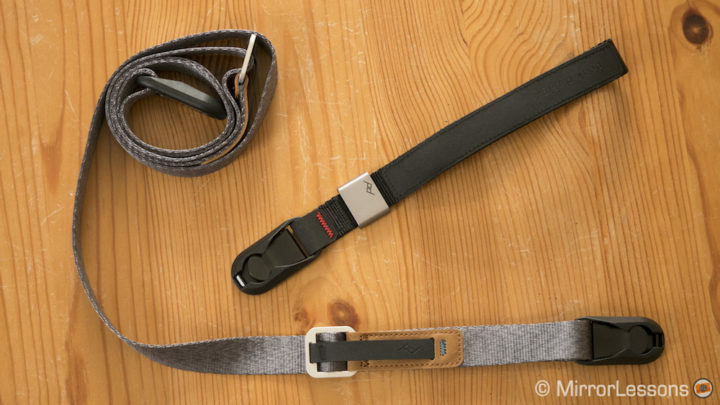 The Leash is Peak Design’s slimmest strap and also one of its most versatile in that it can be used as a neck strap, sling strap, or safety tether. 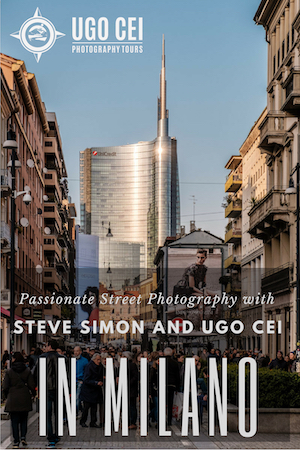 It best suits small to medium sized mirrorless cameras with a lightweight prime lens or kit zoom attached. A few subtle changes have been made in comparison to the original Leash (review here), so let’s have a look at them now. 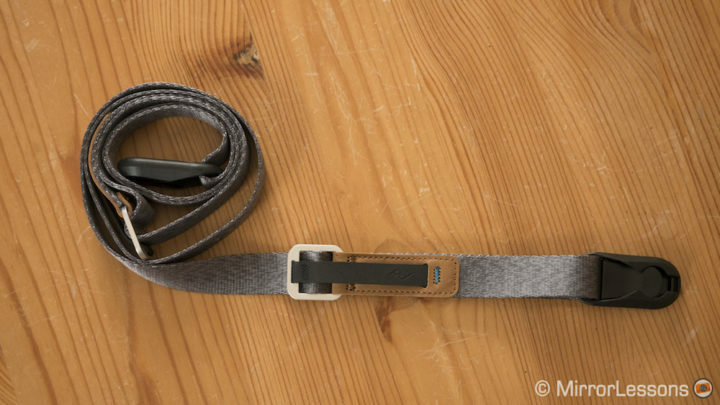 First of all, you’ll notice that the Leash now has two updated quick-adjusters made of aluminium and Hypalon hardware. Unlike the single plastic adjuster on the old Leash which could be a bit fiddly to adjust on the fly, these new adjusters get the job done in seconds: all you need to do is tug up or down on the Hypalon loop with one finger and you can rapidly change the length of the strap, even when it’s around your neck or on your shoulder. The second update is the new low-profile Anchor Mount which attaches to the tripod mount of your camera. Made of aluminum anodised hardware, it lets you use the Leash as a cross-body sling instead of a neck strap. The only downside to the Anchor Mount is that you have to remove it if you want to use the camera on a tripod, whereas the Standard Plate that comes with the Slide can be used as both an anchor mount and a tripod plate. 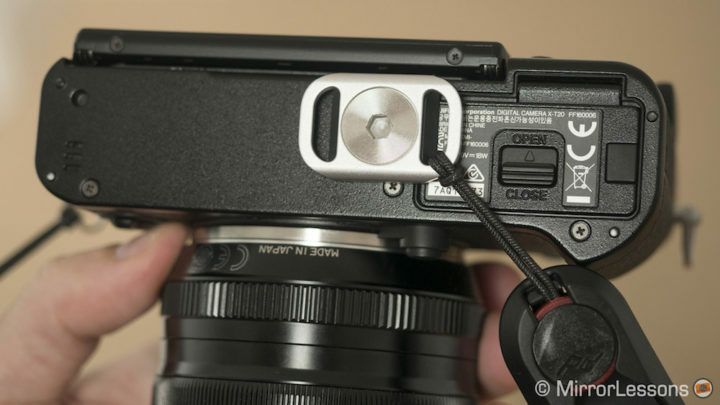 It also blocks the battery compartment on some cameras like the Fujifilm X-T20. 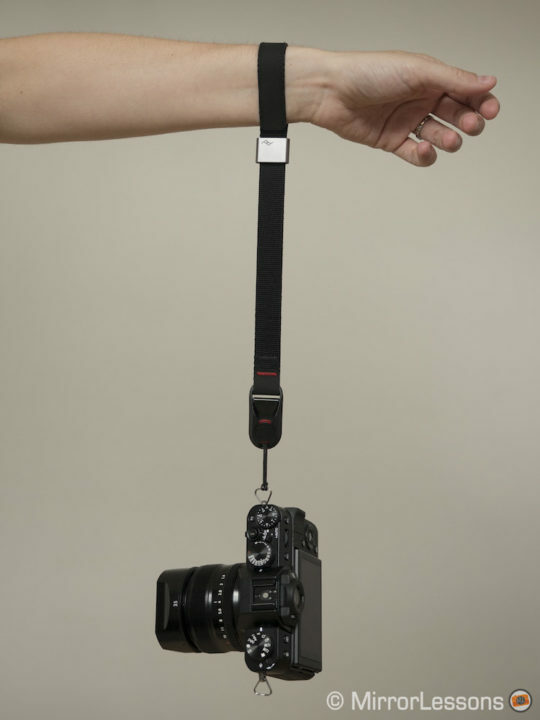 The Cuff is Peak Design’s wrist strap and while we never actually reviewed it, we did have the chance to use it a few times with our small mirrorless cameras. It was admittedly the product that impressed us the least as it wasn’t particularly easy to adjust on the go. 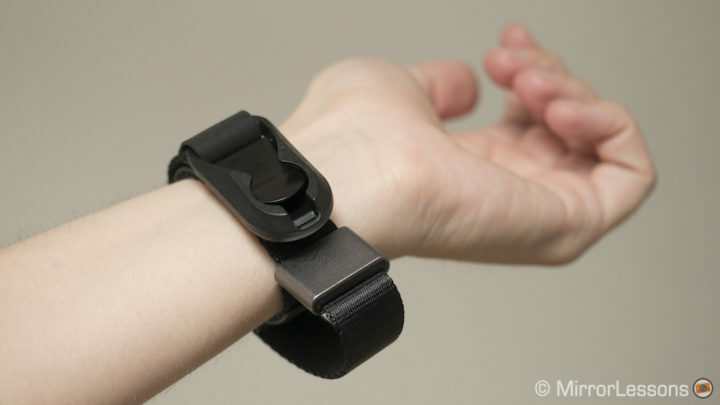 The updated version of the Cuff is a much better product thanks to the subtle tweaks Peak Design has introduced. 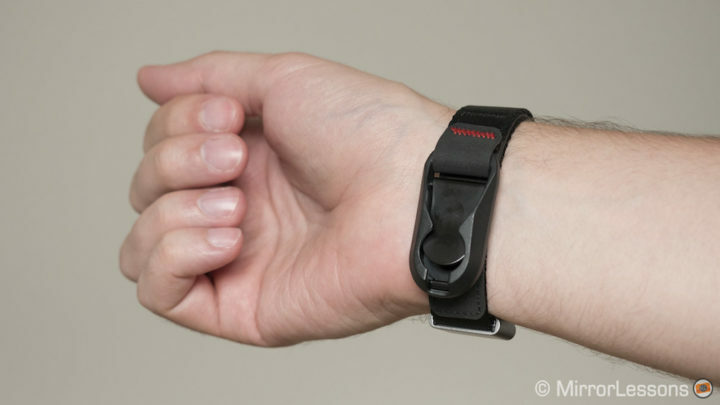 First, it now uses a new one-handed adjustment system whereby the strap instantaneously adjusts to the width of your wrist when you tug on the connector or when you let a camera body hang from it. 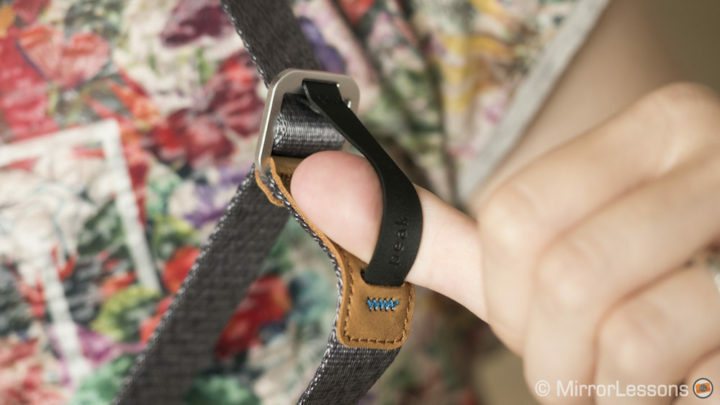 To loosen the strap, all you have to do is pull down on the adjuster. Second, when you aren’t using the Cuff, there is now the option to wrap it around your wrist as if it were a bracelet. It stays in place thanks to a magnetic wrist lock located inside the material and you can adjust the magnet’s position to fit your wrist size. While I can appreciate this second update, I personally didn’t find it very useful because my wrist is too small. As you can see from the picture below, the excess nylon bulges out to one side when the magnet and connector are aligned. Mathieu, on the other hand, had no problem at all because his wrist is thicker. This small design flaw leads me to believe that the Cuff was primarily conceived with male users in mind. 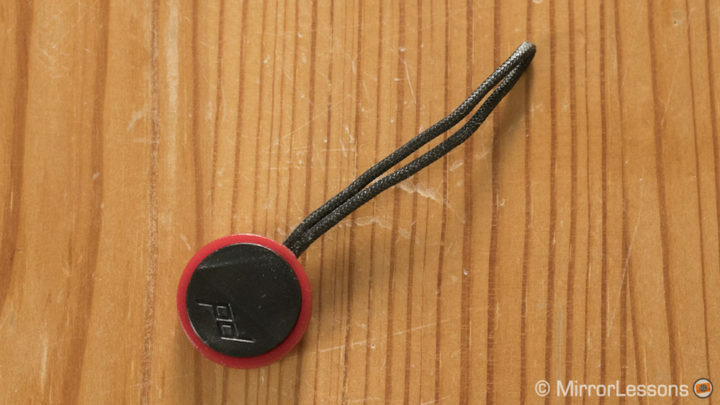 Also keep in mind that the magnet isn’t particularly strong, so if you shake your wrist, the connector may detach. 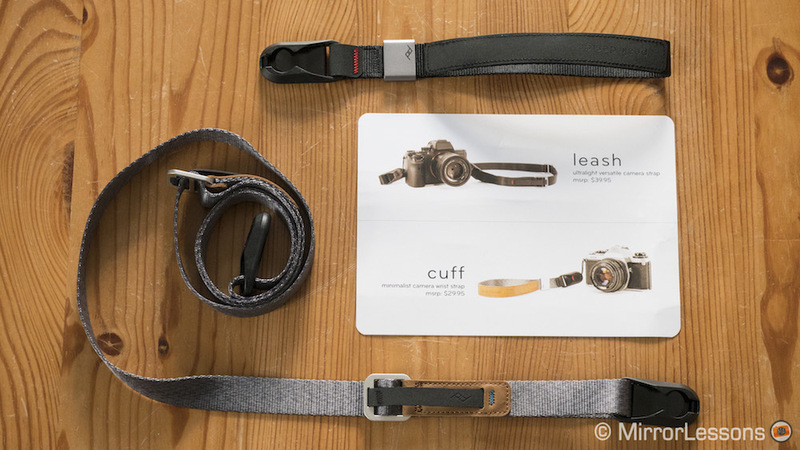 Both the Leash and Cuff use Peak Design’s innovative Anchor Link system, and it’s great to see that the company has updated the links to make them even more user-friendly. They are just as strong as the old anchor links, able to sustain weights of up to 200lbs, but the cord is around half the thickness, meaning that you can slide them directly through the eyelets of many cameras or the Anchor Mount that comes with the Leash. They are also slightly angled, making it easier to lock them into the connectors than ever before. The nylon webbing used for the two straps has also been improved. Not only is it smoother and more twist-resistant but it also features a tighter, more durable weave, making it easier to adjust. To the touch, it feels silky smooth and glides easily along clothing and skin. Finally, both products are now available in two colours: black (which was the only colour the original Leash and Cuff were available in) and Ash. We received the Ash version of the Leash to test and I have to say that it looks extremely classy and professional, especially with the tan leather accents along the adjusters. 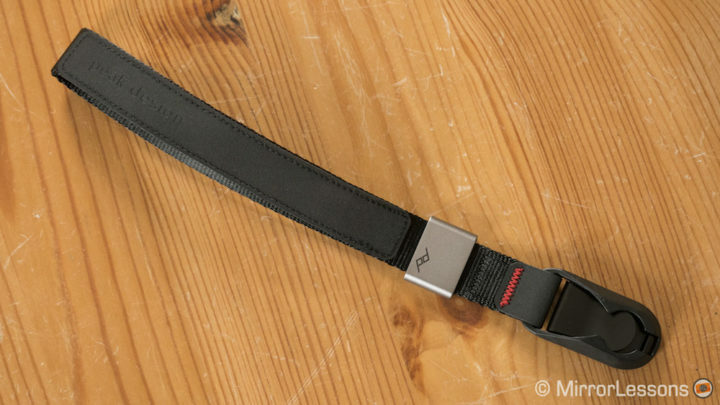 We’re really pleased to see that Peak Design has decided to update the Leash and Cuff. The originals were both good products – especially the former – but the subtle updates to their design have put them on the same level as, if not one step above, the Slide in terms of their overall functionality. 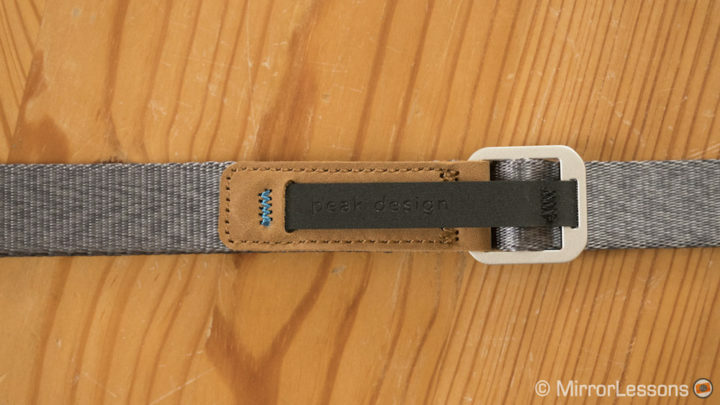 Hopefully some of these updates, such as the smoother nylon webbing and new anchor links, will trickle down to Peak Design’s flagship strap sometime in the near future!